I have always been buying these bars from the stores and gosh they are so expensive. Never knew the recipe would be so easy until I came across numerous recipes over internet. 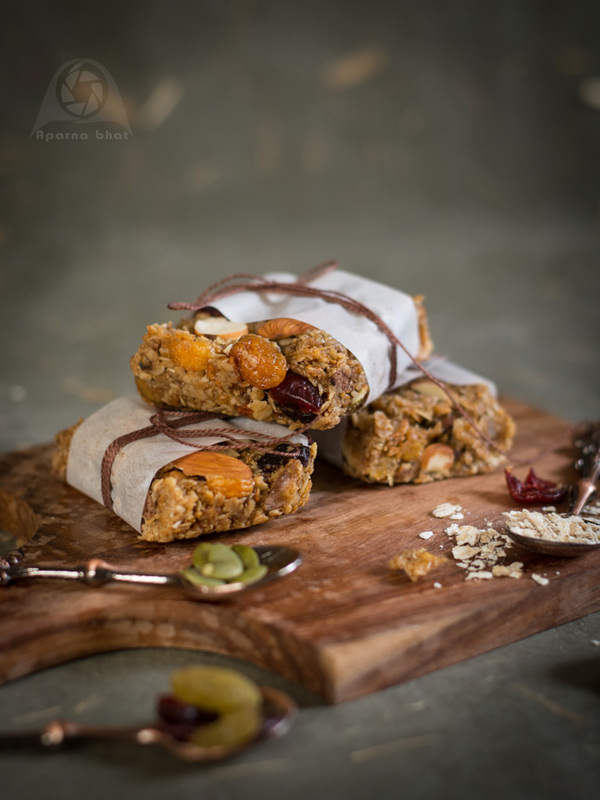 While reading through these recipes I realized that making these bars at home is economical. We can use a range of ingredients to suit our family preferences. 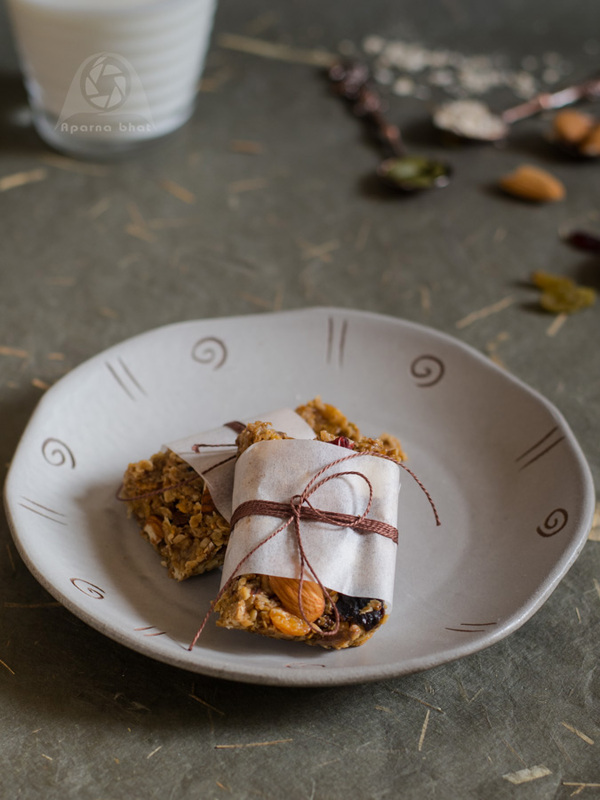 This snack bar is the perfect grab and go choice, so here goes my version of preparing these bars. Preheat the oven at 180 deg C. Line the baking dish with parchment paper and keep it aside. Spread oats, crushed cornflakes, crushed chocos, chopped nuts and seeds evenly on the sheet pan and toast it at 180 deg C for 10 mins. 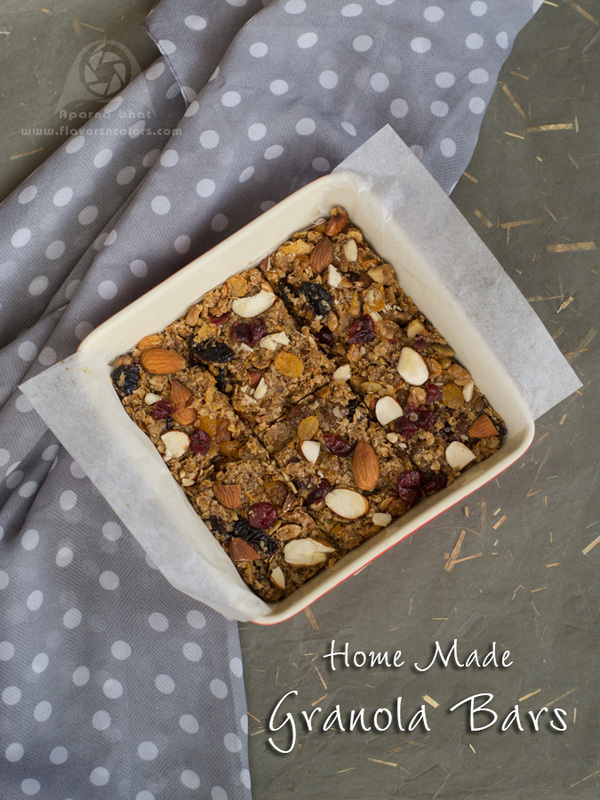 [You may choose to dry roast oats, cornflakes, nuts and dry fruits in a pan until a nice aroma comes. Switch off the flame as oats turn lighter brown in color]. Keep it aside. Now take butter in the same pan, heat until it melts. Next add honey, brown sugar, and water. Heat it until the mixture starts bubbling up. Cook it for another minute and then add vanilla essence. Simmer the flame. Add roasted oats -cornflakes -nuts -raisins mixture and mix well till it gets coated with liquid mixture on all sides. Switch off the flame. Transfer the mixture to a greased plate and spread it using a wooden ladle to 1/4 to 1/2 inch thickness. Allow them to cool for 5 -8 minutes and then cut into bars. Cool down and store in an airtight container. An optional step that you may do is once you cut them into bars, bake them in an oven at 200 deg C for 5 -7 minutes to make them more crispy.